Download "Design System review of Medline, CINAHL, AMED, PEDro, and Cochrane databases till August 2010." 2 reviews; regarding surgery versus conservative treatments (Kovacs et al. 2011), and regarding the lack of even moderate evidence for any of the conservative treatments mentioned earlier (Ammendolia et al. 2010). Ours was the largest review to date, and was not limited by non-english publication bias. References Ammendolia C, Stuber K, de Bruin LK, Furlan AD, Kennedy CA, Rampersaud YR et al. Non-operative treatment for lumbar spinal stenosis with neurogenic claudication: a systematic review. Spine DOI: //BRS.0b013e318240d57d Kovacs FM, Urrutia G, Alarcon JD. 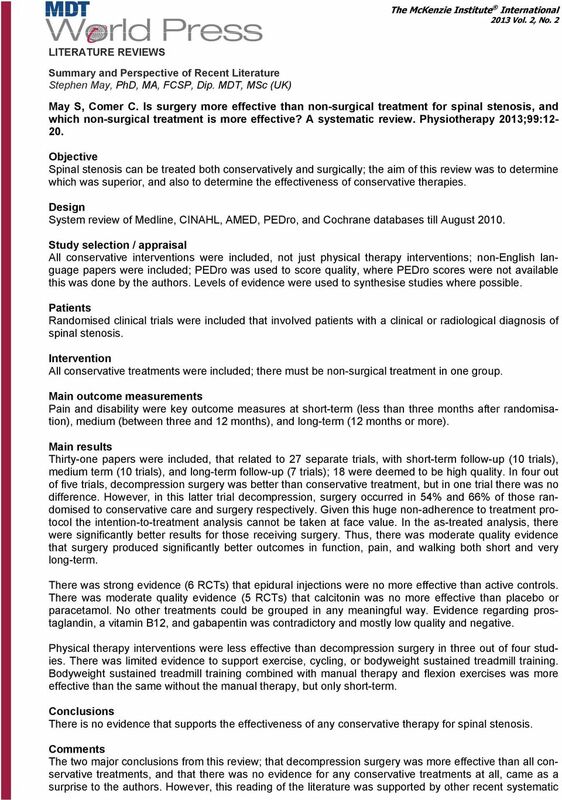 Surgery versus conservative treatment for symptomatic lumbar spinal stenosis. Spine 2011;36:E1335-E Slaven EJ, Goode AP, Coronado RA, Poole C, Hegedus EJ. The relative effectiveness of segment specific level and non-specific level spinal joint mobilization on pain and range of motion: results of a systematic review and meta-analysis. J Man Manip Ther 2013;21:7-17. To examine the effects of a single session of joint mobilisation on pain at rest and on movement, and to compare the effects of specific and non-specific mobilisation at segmental levels. Systematic review of MEDLINE, CINAHL, PEDro to November 2010; quality was assessed using criteria from a previous Cochrane review; and where possible meta-analysis was conducted. 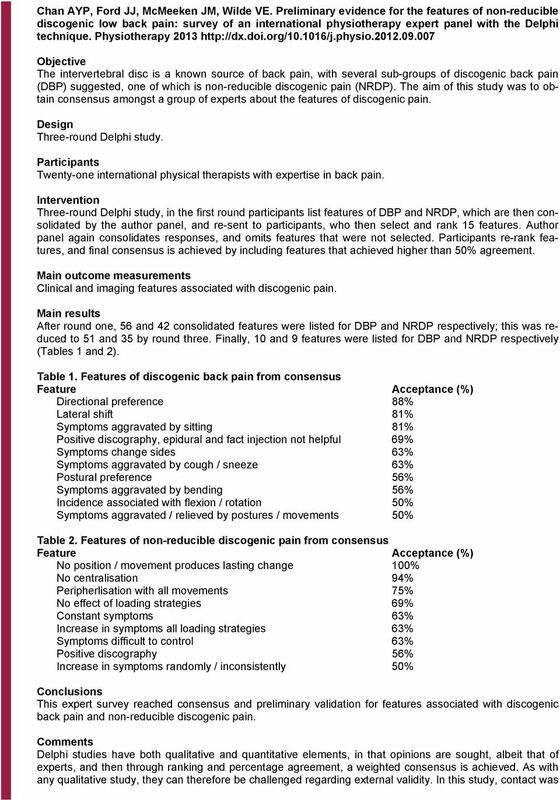 Patients and intervention Randomised controlled trials were included that evaluated the effect of a single session of joint mobilisation (non-thrust) on patients with cervical, thoracic, or lumbar pain. Studies evaluating the effects of manipulation thrust techniques, or long-term studies were not included. Immediate, within session changes in pain at rest and most painful movement. Eight articles were finally included, with seven deemed to be high quality. There was some evidence from four studies that in the cervical spine segment specific mobilisation is favoured (mean difference -0.41), whereas in the lumbar spine non-specific mobilisation is favoured (mean difference 0.29). Similar effects were found on the most painful movement; mean differences -0.27, and 0.34 respectively for the cervical and lumbar spines. Multiple studies showed single sessions of joint mobilisation could reduce pain at rest and with movement. However, whether this mobilisation needs to be specific regarding segmental level appears to be influenced by the segmental level. In the cervical spine, segmental specific mobilisation appears to be more effective, but in the lumbar spine non-specific mobilisation. Given the short-term nature of the follow-up in all these studies, little conclusion can be given about the long-term efficacy of mobilisation. But these trials also looked at the specific segmental level of these mobilisations, and found this was not always relevant to having an effect. Of the eight trials selected for the review, six of the eight involved patients with some kind of neck pain, and in the majority of these studies segmental-specific mobilisation had a greater effect than randomly selected mobilisation. In the two studies involving patients with back pain, there was little or no difference between randomly-selected and segmental-specific mobilisation techniques. 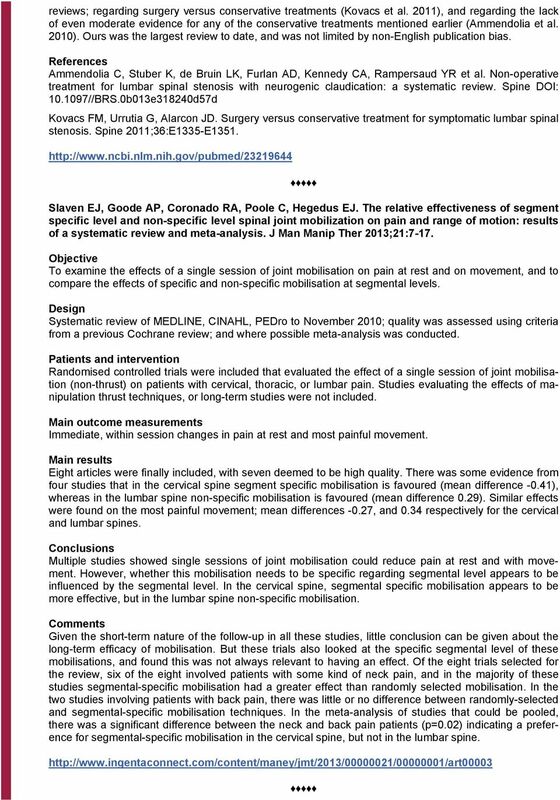 In the meta-analysis of studies that could be pooled, there was a significant difference between the neck and back pain patients (p=0.02) indicating a preference for segmental-specific mobilisation in the cervical spine, but not in the lumbar spine. 5 cant differences between groups (Figure 1). There were minor improvements in dysfunction, with significant differences favouring the McKenzie group at one month (p=0.004), but no long-term differences (Figure 2). There were significant differences short-term in terms of dysfunction in the McKenzie approach, but in no other outcomes. Figure 1. Pain intensity changes baseline 1M 3M 6M Back School McKenzie Figure 2. 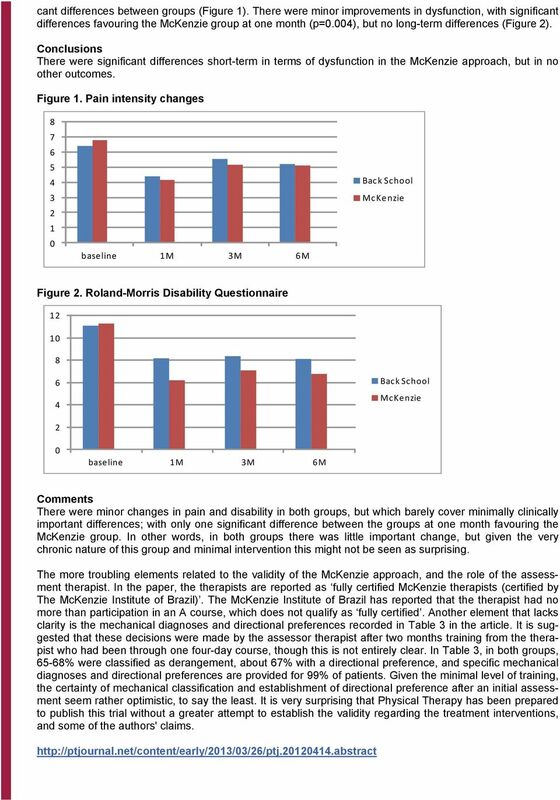 Roland-Morris Disability Questionnaire Back School McKenzie 2 0 baseline 1M 3M 6M There were minor changes in pain and disability in both groups, but which barely cover minimally clinically important differences; with only one significant difference between the groups at one month favouring the McKenzie group. In other words, in both groups there was little important change, but given the very chronic nature of this group and minimal intervention this might not be seen as surprising. The more troubling elements related to the validity of the McKenzie approach, and the role of the assessment therapist. In the paper, the therapists are reported as fully certified McKenzie therapists (certified by The McKenzie Institute of Brazil). The McKenzie Institute of Brazil has reported that the therapist had no more than participation in an A course, which does not qualify as fully certified. Another element that lacks clarity is the mechanical diagnoses and directional preferences recorded in Table 3 in the article. It is suggested that these decisions were made by the assessor therapist after two months training from the therapist who had been through one four-day course, though this is not entirely clear. In Table 3, in both groups, 65-68% were classified as derangement, about 67% with a directional preference, and specific mechanical diagnoses and directional preferences are provided for 99% of patients. Given the minimal level of training, the certainty of mechanical classification and establishment of directional preference after an initial assessment seem rather optimistic, to say the least. It is very surprising that Physical Therapy has been prepared to publish this trial without a greater attempt to establish the validity regarding the treatment interventions, and some of the authors' claims. Clinical Reasoning The patient presents with no red flags and no indications of maladaptive behaviour in regard to fear avoidance. Manual treatment for neck pain; how strong is the evidence? Short Question: Specific Question: In patients presenting with acute or chronic tendinopathies, what is the incidence of harm for those receiving steroid injections compared to those receiving usual care? Is electrotherapy more effective than other physical therapy approaches in reducing pain and disability in adults with supraspinatus tendonitis? Is electrotherapy more effective than other physical therapy approaches in reducing pain and disability in adults with supraspinatus tendonitis? Is one modality of electrotherapy more effective than another? Objectives. Clinical Decision making for Neck Pain: Use of Clinical Prediction Rules and Current Evidence for Manual Therapy. 1 Spinal Decompression: Measurement of Treatment Outcomes. William D. Grant, EdD Catherine E. Saxton, BS Correspondence to: William D. Grant, EdD SUNY Upstate Medical University IHP 3302 750 E. Adams St.
Our mission is to help you experience the greatest benefits possible. Our physicians and care staff are dedicated to your needs. 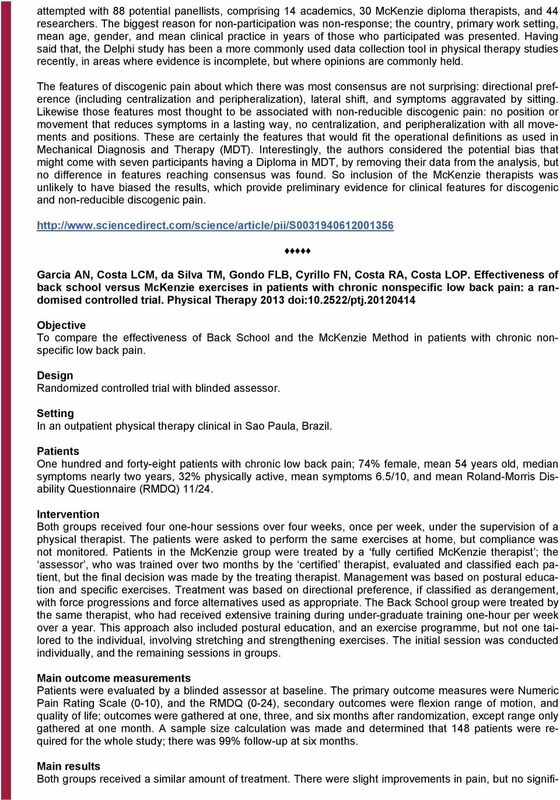 Updates into Therapeutic Exercise Programs for Patients with LBP. Maximizing Patient Motivation and Outcomes Alice M.
Ms. Jackson is the Manager of Health Finance and Reimbursement, Division of Health Policy and Practice Services, Washington, DC.